Remove stems from apples and insert popsicle sticks into the center of the top of the apple. In microwave-safe bowl, add caramels and Whisper Creek. Microwave on high for 2 minutes. Remove bowl from microwave and stir caramel until smooth. Working quickly, gently roll apples in caramel until evenly coated and place on parchment-lined baking sheet. Once all apples are dipped, place baking sheet into refrigerator to set. **For added embellishment, roll freshly dipped apples in chopped pecans or drizzle with melted chocolate before they go in the fridge. We hear time and time again from professional and home bakers alike that Whisper Creek makes the perfect secret ingredient for many of their favorite desserts! It should come as no surprise, as it's one simple ingredient that can add layers of flavor. Besides the flavor of real Tennessee Whiskey, Whisper Creek has more than 30 other all-natural flavors to add to your recipes. This decadent recipe is deceptively simple and can be made in miniature versions as we've done here or in one large bundt cake pan. To be really sinful, serve it with a small glass of Whisper Creek to pour over the top! Mix cake batter according to package directions, substituting Whisper Creek for the water called for in the recipe. Divide among 8-10 mini bundt cake pans or one large bundt cake pan and bake according to directions on cake mix package. While baking, make the glaze by melting butter in a medium saucepan over medium high heat. Add brown sugar and stir to combine. Bring mixture to a bubbling boil and remove from heat. Carefully whisk in Whisper Creek and set aside. Once cakes are baked, remove from oven and shake lightly to loosen from the pans. Divide syrup equally among the cakes and ladle over top, allowing it to soak into the cake. Let cool before removing from pans. To ease in removal, place cake(s) in a hot oven for 5-10 minutes to soften the glaze. Serve with whipped cream or ice cream and a small glass of Whisper Creek to pour over top. Brownie Pie!?! Who would of thought you could combine two delicious desserts in one? Well, lucky for you, we did! This simple to make decadent dessert adds even more decadent flavor with a touch of Whisper Creek right in the brownie batter! Feel free to experiment and make it your own by using white chocolate chips or adding candied pecans. Preheat oven to 350 degrees. Prepare the pie dish by lining with the pie crust. Mix brownies according to directions, substituting Whisper Creek for water called for in recipe. In a separate bowl, toss chocolate chips and pecans with the flour and fold into brownie batter. Fill deep dish pie crust with brownie mix and bake for approximately 45 minutes or until crust is browned. Remove from oven and let cool completely before serving. If desired, you can heat the slices in the microwave and serve with whipped cream or ice cream. Is there any dessert as decadently-Southern as a homemade Pecan Pie? We think once you taste this pie with all the flavors of Whisper Creek mingling with the sweet and nutty filling, you'll agree that this might just be the best one you've ever tried. Whisper Creek is made with real Tennessee Whiskey and more than 30 all-natural flavors, all of which combine to make it a favorite 'secret' ingredient for pastry chefs all over the country. This recipe will make one deep-dish pie or two regular pies. Add corn syrup, sugar and butter to a medium-sized saucepan and bring to boil, stirring often. Allow mixture to cool down for 3-5 minutes. In a large mixing bowl, add boiled mixture, vanilla, dark molasses, Whisper Creek, pecans and eggs (all remaining ingredients) and mix well. Fill (2) 9” pie shells or one deep dish pie. Cook at 350° for approximately 45 minutes or until done. Makes one deep dish pie or two regular pies. Who said kids were the only ones that loved frozen treats? These boozy Whisper Creek popsicles are definitely NOT for the kids. These sweet frozen treats are strictly for the adults! Easy to make, all you need is a good popsicle mold, a handful of simple ingredients, 24 hours in the freezer and you're ready to party! Combine all ingredients and mix until sugar dissolves. Pour into popsicle molds and freeze 24 hours. Enjoy! Part dessert and part cocktail, these fun ice cream floats get a kick from a little Whisper Creek. Easy to make at home, try experimenting with different flavors of ice cream and sodas. Made with just two ingredients, this a simple sweet treat that you can whip up in just minutes! In an industrial blender (such as a VitaMix) or food processor, pulse the bananas and Whisper Creek until combine until smooth. Salted caramel is that perfect blend of sweet and salty that makes folks go nuts! Add in some roasted pecans and the subtle flavoring of Whisper Creek Tennessee Sipping Cream and this ice cream is purely addictive! Start by making the caramel. Add the sugar to a completely dry saucepan and place over medium heat. Do not stir or touch the sugar, but watch it closely as it begins to melt. Once you see the sugar start to melt around the edges, stir it from outside in with a silicone spatula. Blend the sugar until it is fully combined and continue cooking as it darkens. Do not step away during this process, as the sugar can quickly go from tasty caramel to bitter and burnt. Once the sugar is a medium-brown color and smells strongly of caramel, remove from head and carefully add the cream, stirring constantly. Be careful, as it will bubble violently at first. Add the remaining cream, milk and salt. Put the yolks in a metal or glass bowl and whisk lightly. When the cream mixture is starting to steam, whisk a cup or so, ¼ cup at a time, into the yolks to temper them. Once the eggs are tempered, slowly whisk them into the cream mixture. Stirring constantly, cook over low heat roughly 5 minutes, or until the cream mixture has thickened enough to coat the back of a wooden spoon. Do NOT let this mixture come to a boil. Turn off heat and stir in the Whisper Creek and vanilla extract. Chill the mixture in your refrigerator until completely cool. Process according to the instructions of your ice cream maker. Blend in pecans and transfer to a freezer-safe container and freeze for as long as you can, preferably overnight. There are few desserts as pleasing to the Southern palate as Banana Pudding. Whisper Creek® adds a new dimension of complimentary flavors that are sure to make your next batch of Banana Pudding a stand-out favorite. Shhh…Whisper Creek® can be our little secret. In a large mixing bowl, beat pudding, milk and Whisper Creek® for 2 minutes. Blend in sweetened condensed milk and vanilla. Fold in whipped topping. Peel and thinly slice bananas before folding into the pudding mixture. Layer in a serving bowl with wafer and chill before serving. Serve with an additional dollop of whipped topping (optional) and a vanilla wafer. 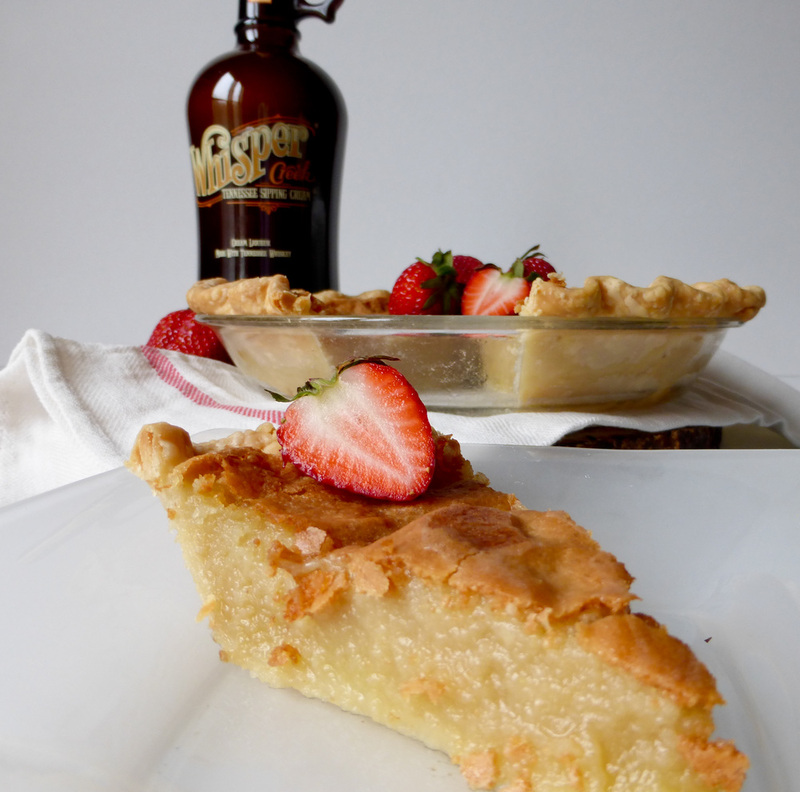 The sweet simplicity of chess pie gets a boost of flavor from just a third of a cup of Whisper Creek. The alcohol burns off as the pie bakes, leaving behind a complex combination of southern flavors. Preheat oven to 350 degrees. Cream butter, sugar and flour with an electric mixer until light and fluffy. Add eggs one at a time, beating well until each is fully incorporated. Add Whisper Creek, vanilla and evaporated milk and combine fully. Pour into prepared pie crust and bake at 350 degrees for 40-50 minutes or until filling is set. Remove from oven and let cool before serving. Easy to make and better when made in advance, this dessert combines the rich flavors of chocolate and Whisper Creek with the light tart flavor of Greek yogurt to make a refreshingly simple treat. Bake the chocolate cake according to package directions and let cool. In a large mixing bowl, whip Whisper Creek with vanilla pudding for two minutes before folding in Greek yogurt and whipped topping. Slice cake into thin (1/2 in or less) layers. Start layering the cake and filling by starting with a layer of cake in the bottom of your dish and alternating with filling until done. Refrigerated overnight and serve. Layered with almost two-dozen all-natural flavors, Whisper Creek is that perfect secret ingredient for baked goods and desserts. These luscious little cupcakes are no exception, as the Whisper Creek adds subtle sweetness that will please everyone at the party. Start by making the cupcakes according to cake mix directions, except substitute Whisper Creek for the water that is asked for with an additional 1/4 cup to compensate for the evaporation of alcohol. Bake the cupcakes and let cool before poking the tops with a fork to make small holes. Optional: brush the tops of the cupcakes with the ¼ cup Whisper Creek and allow to absorb before frosting. To make the frosting, cream butter, powdered sugar and whisper creek together with an electric mixer until light and fluffy. Top the cupcakes with the frosting, serve and enjoy! Note: while there will still be some alcohol in the frosting and a little that is brushed on to the cupcakes, it is a nominal amount. The alcohol in the batter will cook off while the cupcakes are baking. Everybody screams for ice cream! This has never been more true than when you make it with Whisper Creek Tennessee Sipping Cream. Layered with almost two-dozen all-natural flavors, Whisper Creek is the one ingredient that adds complexity and dimension to almost any sweet treat. Combine the cream, milk, sugar, and salt in a large saucepan and cook, stirring with a wooden spoon, over medium heat. Put the yolks in a metal or glass bowl and whisk lightly. When the cream mixture is starting to steam, whisk a cup or so, ¼ cup at a time, into the yolks to temper them. Once the eggs are tempered, slowly whisk them into the cream mixture. Stirring constantly, cook over low heat roughly 5 minutes, or until the cream mixture has thickened enough to coat the back of a wooden spoon. Do NOT let this mixture come to a boil. Turn off heat and stir in the Whisper Creek and vanilla extract. Chill the mixture in your refrigerator until completely cool. Process according to the instructions of your ice cream maker. Spoon ice cream out of ice cream maker and freeze for as long as you can, preferably overnight. Who doesn't remember the joy of licking the frosting off the beaters as a child? It's a shame folks don't make it from scratch anymore, as it's about as easy to make as toast! Let this simple recipe be your starting point and experiment with adding extracts like vanilla or almond, or sifting in cocoa powder or even instant coffee! Cream the butter and powdered sugar together in a mixer until light and fluffy. Add the Whisper Creek® and mix until combined. Whisk eggs, sugar, vanilla and cinnamon together in a large mixing bowl. Reserve 1/3 cup each of heavy cream and Whisper Creek and pour remaining 1 2/3 cups of cream and 1/3 cup of Whisper Creek into egg mixture. Blend well until combined thoroughly. Cut bread into 1 inch cubes. Toss well with custard mixture and refrigerate overnight to allow bread to absorb. Preheat oven to 350. Remove soaked bread from refrigerator and transfer to a well-greased oven-safe dish or cast iron skillet. Spread the mixture out evenly and drizzle remaining 1/3 cup of cream and Whisper Creek evenly over the top. Cover loosely with foil and place in the center rack for approximately 45 minutes until the bread pudding puffs in the center. Remove foil and return to oven for another 10 minutes or until the top browns lightly. While baking, prepare the caramel sauce by adding cream, sugar and butter to a small saucepan over medium heat. Slowly heat until almost boiling. Blend the cornstarch with the Whisper Creek and stir into the hot cream and sugar mixture. Bring to a boil to thicken and remove from heat. Serve bread pudding warm with caramel sauce. If desired, top with a dollop of freshly-whipped cream. Who doesn't love a warm apple crisp? This easy recipe pulls together the complex flavors of Whisper Creek to enhance the apple and pecan flavors of the dessert. Baked individually as we have done or in one large dish, it is a quick and easy option that is sure to please! If you really want to be decadent, top it with one of our homemade ice cream recipes: Salted Caramel & Pecan Whisper Creek Ice Cream or Whisper Creek Ice Cream. Preheat oven to 350 degrees. Toss apples with apple butter, Whisper Creek, granulated sugar and ½ tablespoon flour until well combined. Set aside. Mix remaining ingredients together until combined to form crumb topping. Divide apple filling into 4-6 well-greased oven-safe dishes. Apple mixture should rise above the top, as it will settle when cooking. Top each with crumb topping, place on a baking sheet and bake in the center rack for approximately 25-30 minutes or until top has browned lightly and apples are bubbling. Hours of operation: Thursday - Saturday 12-7 pm. Tours at the top of each hour from 12-6 pm.